Hi, ladies! Have you ever tried to do peeling before? I didn't even dare to try peeling before because I thought peeling would be all like red facial skin, exfoliating skin, irritation, and so on. But it all changed when I tried this water-based peeling from V10 Plus, which is currently popular around beauty bloggers. It's really easy to use and feels more like body scrub, maybe? So it doesn't irritate my facial skin and there's no redness. Well, enough blabbering and let's get to the full review. V10 Plus is a skin care corporation based in Singapore, originated from Japan. Our skin care products varied from facial cleanser until lifting cream. However, V10 Plus specialized in serum where we have 11 different serums in which each serum has their own function for our skin, on top of that, the most important thing is all of our serums can be mixed with your current skin care, therefore, we called it as a supplement. 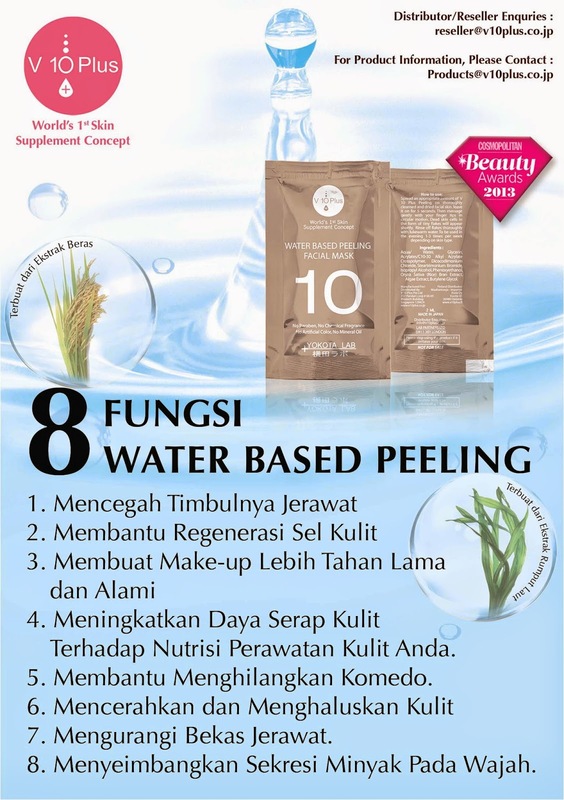 Now, V10 Plus is expanding to Indonesian market and we sell our best-selling product which is "Water Based Peeling". For more information about V10 Plus, check out their website here or their Indonesian facebook page here. The packaging basically looks like a pamphlet about as big as A4 paper. The 'inner page' is basically consist of the left side and right side page. 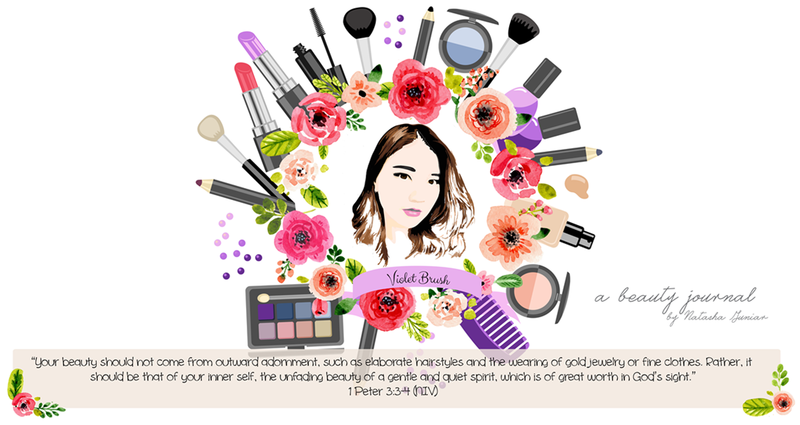 On the inner-left page, written the main active ingredients of the products and its features (will talk about it on 'What It Claims' section), also the directions on how to use this product with pictures. On the inner-right page, there are 10 sachets of the Water Base Peeling Facial Mask and beauty tips from Mrs. Akiko Yokota (V10 Plus Founder) behind each pack. I will translate each one of the beauty tips in separate section. Personally, I think I like how this product comes in sachets since it's sufficient enough for one time usage and it's more hygiene. On the back page, there's a picture of V10 Plus' 2013 ambassador, Ms. Nina Chui who is 2013 Miss Singapore Friendship International, and an e-mail address to contact for more information. Moving on to the little pack's packaging, the front side is exactly the same as the one printed on the front page. On this side, it's written that this Water Based Peeling Facial Mask contains No Paraben, No Chemical Fragrance, No Artificial Color, and No Mineral Oil. On the back side, there are directions on how to use the product, ingredients of the product, manufacturer and distributor details, and warnings. Use peeling to exfoliate dead skin cells for 2-3 times a week to avoid dry skin. Dead skin cells which are not exfoliated, could block the absorption of the nutrients from the skin care products you use. Choose water-based skin care products since it's safe for every skin type, even the sensitive ones. Don't use facial scrub every single day since it could irritate your skin. Wash your face every night before sleeping, make it as a habit. Protect your skin from sun rays by using sun block every time you're going out. Drink mineral water 6-8 glasses a day. Water will clean your skin and make your skin looks glowing because water accelerate detoxification of the body. Fruits and vegetables which contains high protein will make your skin looks glowing. Keep your sugar intake below 45 gr to avoid swollen-looking face. Cardio exercises will make your skin looks glowing since it stimulates the blood circulation. First of all, it's written that this facial mask is to be used in the afternoon, once up to thrice a week depends on your skin type. Wash your face and dry it beforehand. Apply the Peeling Gel evenly to the entire of your face. Let it be for about 5 seconds. 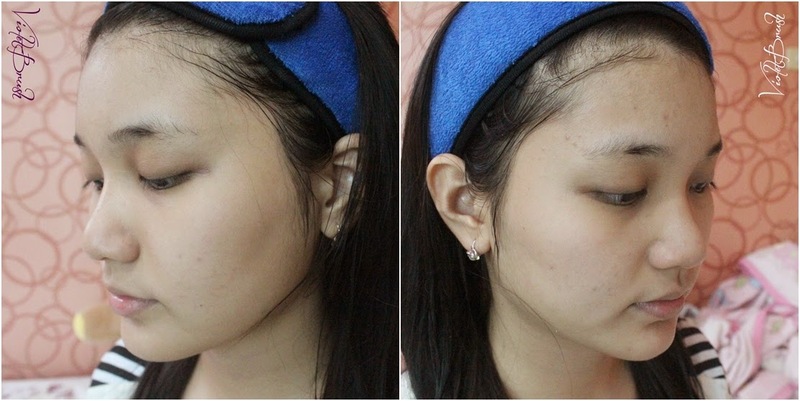 Massage your face in circular motion softly using your fingers. Dead skin cells will directly appeared in soft fibers (?). Rinse your face entirely with warm water and wipe with wet towel. As you can see on the photo above, the Peeling Gel is a clear gel and the texture is really watery. The peeling gel is scent-less, there isn't any scent at all, as what it claims: no artificial fragrance. Water Based Peeling Facial Mask contains No Paraben, No Chemical Fragrance, No Artificial Color, and No Mineral Oil. I tried to apply this Peeling Gel to my hand and as you can see on the photo above, the results can be seen instantly. My skin looks brighten instantly. 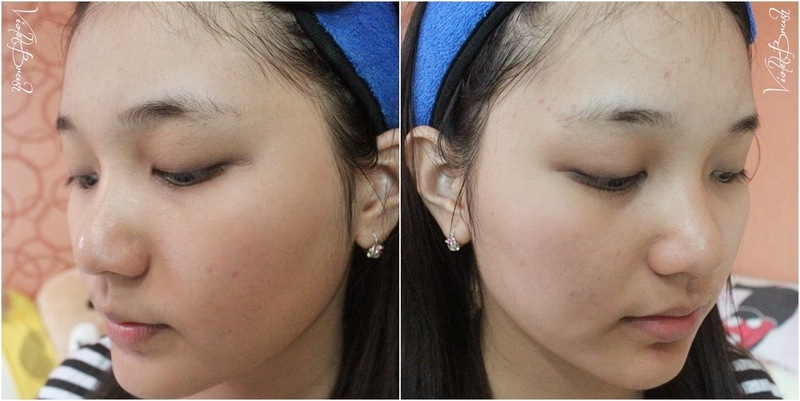 The effect of the Peeling Gel could be seen instantly. As you can see on the picture, it reduced the redness of my skin and some blemishes magically faded. It also brightened up my skin, my skin felt smoother and fresh instantly after usage. After about 3 weeks of usage, I can conclude that it does reduce the acne on my skin, however, it doesn't prevent acne from appearing, perhaps because I did sleep late these days but the acne did appear, one or two. I'm not someone who got a lot of acne at once, actually. It also reduces my blackheads even thought not that much.